How satisfying is the fourth and final season of the 12 Monkeys TV show on Syfy? 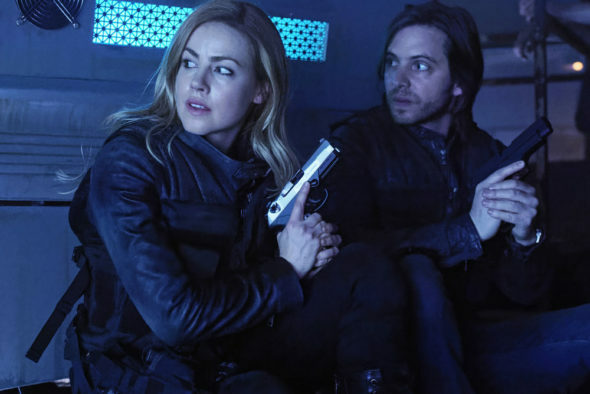 As we know, the Nielsen ratings typically play a big role in determining whether a TV show like 12 Monkeys is cancelled or renewed for season five. Unfortunately, most of us do not live in Nielsen households. Because of that, many viewers are frustrated their viewing habits and opinions weren’t considered, before Syfy decided to end (i.e. cancelled) 12 Monkeys after its fourth season. We care what you think, so we invite you to rate all of the 12 Monkeys season four episodes for us here. What do you think? Which season four episodes of the 12 Monkeys TV series do you rate as wonderful, terrible, or somewhere between? Should Syfy have cancelled or renewed 12 Monkeys for a fifth season? Don’t forget to vote, and share your thoughts, below. More about: 12 Monkeys, 12 Monkeys: canceled or renewed? I love the 12 Monkeys. I think there should be a season five. tv shows today have lost there touch and it’s nice to watch a show that reminds you how tv should be, sad to see this show go. thanks to the cast for one hell of a ride. see you soon. Best season since the 1st. Sorry to see it go. I agree, I have been on the edge of my seat for every episode this season…I will miss it! I believe that they were given a 4th season for the purpose of being allowed to wrap up the story. Im grateful that they did, because that doesnt happen with enuf shows. I will miss the show too; I loved every minute of it! !